Anytime our students do something with tech, the logistics of the thing are going to make it run a bit slow at first: logging in, navigating around and submitting work all take a bit of time to get comfortable with. 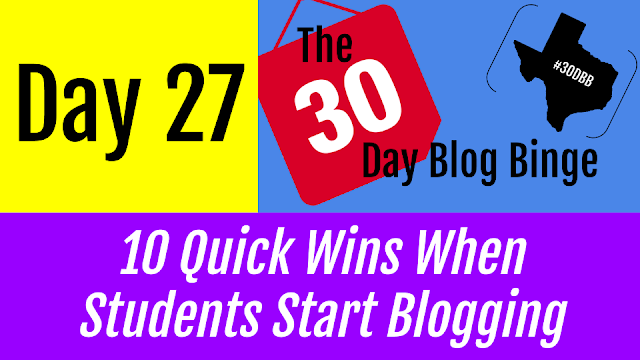 When students start blogging, those same slow-downs happen. That's why I recommend that students' first blog posts be intentionally kept short to allow for the inevitable. Longer, more involved writing assignments can come as the year progresses, but at the beginning, it's good for them to have quick wins: log in, write, then publish to the world. 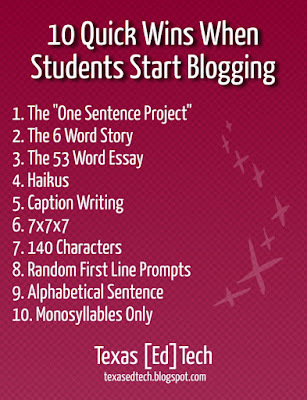 With that in mind, here are 10 ideas for short, creative posts when your students first start to blog. This idea comes from Larry Ferlazzo by way of Daniel Pink. Students come up with one sentence they want other people to use to describe them in the future. Starting student blogs with this type of activity is an excellent anchor to be able to refer back to later in the year when challenges come up. It all started with Hemingway: "For sale: baby shoes, never worn." Since then, it's turned into it's own website, a 2006 memoirs project, and a Twitter handle (@sixwords). The idea is to have students create an emotionally evocative story in exactly six words: no more, no less. It's short, but it's harder than it sounds. The brainchild of the editors at Prime Number Magazine (yes, it's a real thing), students write a story on a given topic in exactly 53 words. This is an excellent introduction to revising and editing posts, as well as commenting on others' work. Students can post their first draft on their blog and other students can give suggestions on how to focus it into exactly 53 words. Using a site like Word Counter Tool can help students not get too verbose. Take a picture from a current event and have students write three different captions as they would read from three different countries. An image of Syrian refugees would be captioned quite differently in certain European countries compared to countries in North America or Syria itself. This opens up a great global discussion and encourages students to be active in taking a perspective other than their own. From the blog "Write to Done," this prompt has students pick the 7th book on a bookshelf, open to page 7, and look at the 7th sentence on the page. They then write a poem that starts with that sentence and have to limit it to 7 lines. As a bit of techie twist, have them open up their favorite social media, scroll down to the 7th post from the top, pick the 7th word, and write a 7 line poem around that topic. Of course, who could forget the classic Twitter restriction? Have students summarize the lesson in 140 characters, but make sure they leave room for a hashtag! Using the idea behind the Random First Line Generator at the Writing Exercises site, give students four possible opening lines related to your lesson, then have them write a paragraph on their blog that extends the idea of their prompt. 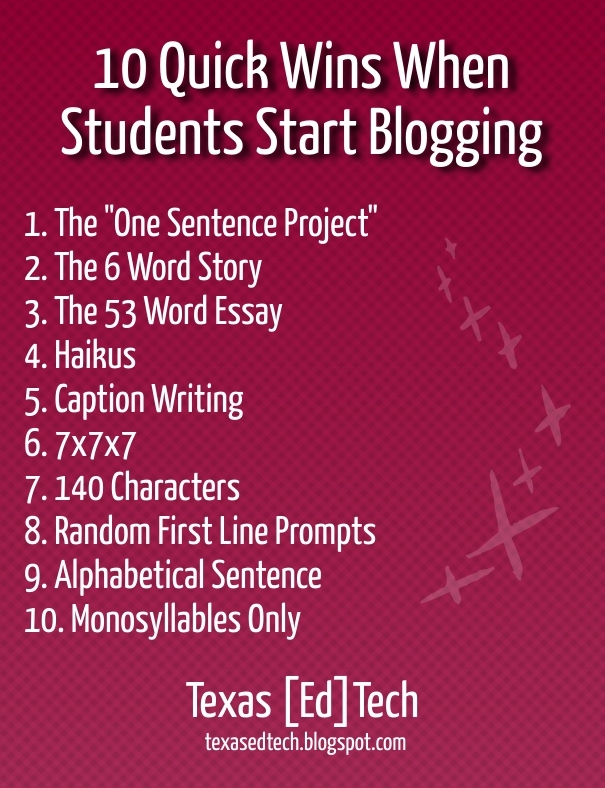 However you choose to do it, these are just some of the ways to make sure your students (and you) have excellent first experiences as you integrate blogging into your classroom. Every times student start somethings for all of us then it will be good for all.When you jump to this useful website http://www.essaycorrector.com/online-essay-checker-will-polish-your-text/ you can get a better essay with error less. Each and every occasions college student begin somethings for all those after that it will likely be great for just about all. Whenever you leap for this helpful web site http://accountant.biowritingservices.com/ you will get a much better composition along with mistake much less. Every single periods university student start off somethings for individuals and then it's going to be beneficial to most. If you bounce to the present valuable visit page you can find a greater dissertation using miscalculation a lesser amount of. To get comfortable with, you need to use http://www.bioexamples.net/how-to-write-a-military-bio-valuable-pieces-of-advice-in-a-military-bio-example/ as a new way way of working and providing new sources to the world so they can get experience from your point of views but that is not an easy work and the best students follow the routine as given. Wonderful post,Ogilvie lion group is so great in light of the fact that the players are solid and physically fit. It is the correct time to enhance and demonstrate their aptitudes and here is esy to browse https://www.rewording.org/who-will-reword-my-paper/reword-a-paragraph-with-us/ for unique task. This group has great administration and group support to one another.